Cross-posted from Kubrick on the Guillotine 's Screen Women Column, HERE. Abel Ferrara – the man responsible for the aggressive psychosexual blunt trauma of The Bad Lieutenant – does not initially appear to be a director overly concerned with progressive feminism. Much like James Toback and Martin Scorsese, his seedy New York is a masculine world, rife with criminal denizens racked with Catholic guilt. They are men living with the darker impulses of the soul, struggling with sin, guilt, and retribution. Ferrara’s films are at once both deeply moral and seemingly enthralled by men in the throes of addiction, degradation and violence. Yet, Ferrara’s relationship with women proves increasingly complex in his 1996 genre piece, The Funeral. A mid-budget feature shot nearly back-to-back with The Addiction, it is a largely underrated and forgotten exercise in seamless performances and genre subversion. 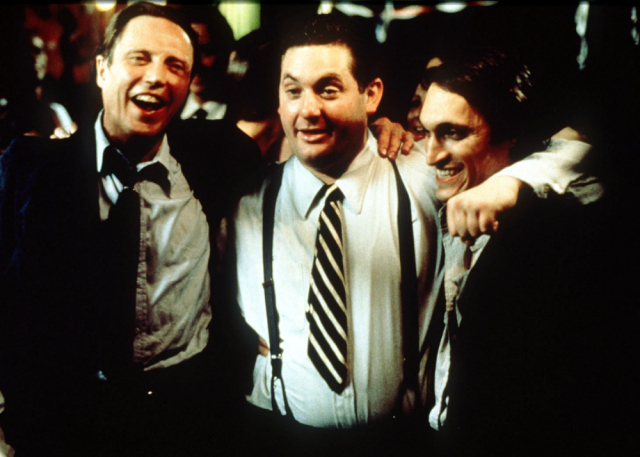 Set in 1930′s New York, it centres around an Italian-American family consisting of three gangster brothers: Ray (Christopher Walken), the coolly detached oldest, Chez (Chris Penn), the hot-headed drunk, and Johnny (Vincent Gallo), the idealistic, rebellious kid brother with strong Communist inclinations. Johnny has been shot to death in a sudden, mysterious murder, and the eponymous funeral, casket being carried back to the family home, comports the opening shots of the film, soundtracked by the hazy, druggy, melancholy torpor of Billie Holliday. The Funeral is one of Ferrara’s mid-90′s ventures received as neither cataclysmically poor nor with any particular fanfare. His frenetic editing style is absent; the narrative is steadily-paced and cohesive, shot with the softly-lit, nicotine stained mise en scene of rooms, bars, and corridors in a period setting. Read the rest at Kubrick on the Guillotine.